At the beginning of December I was lucky enough to win a 12 days of Christmas beauty advent calendar from Tanya Burr on Twitter. The prize arrived on day 4 of the calendar windows, so I made the decision to wait until the weekend came around, and then I filmed my opening of the whole cosmetics calendar in one go. I was very impressed with the style in which this particular calendar was presented. There was huge attention to details and I liked the little touches that have been added to make it feel more special, such as the glitter and the silhouettes. Even the cardboard was decorated throughout to give a Christmas feel, such as the backs of the windows. With each day you opened you felt as though you would be getting a little present. It was exciting to open, and I also tried to avoid looking at other peoples on social media so my surprises were not ruined because I had to catch up on my windows. On the back of the box it has the list of contents of what was contained inside, without any important details. So I will be giving you the individual products names and colours and more information, so if you like the look of something you can go and get it yourself and know what it is that you’re after. Without any more rabbiting on let’s get to the full list of items that were found inside this fabulous 12 days of beauty advent calendar. 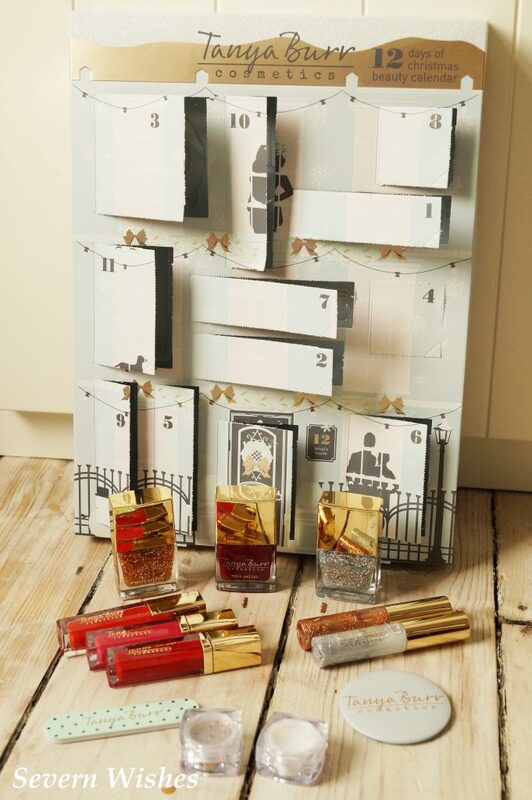 I hope you have enjoyed the reveal of this advent calendar, and if I use and am impressed with any of the products in the future then I shall do a follow up post. Wishing all of you who celebrate it, a very Merry Christmas. Thank you for supporting the Severn Wishes blog. This entry was posted in Beauty, Christmas, Fashion & Beauty, Makeup, Tanya Burr Cosmetics, Unboxing, Winnings by Sabrina. Bookmark the permalink.